Oprah's massive self-worth threatens to take over the world. At first they thought they could keep it tethered by triple-strength titanium-reinforced steel cables, but their calculations proved no match for the huge mass of Oprah’s huge ego, which was already proving to be a huge attraction for Oprahites around the world. Several governmental agencies, including the U.S. Weather Service, are tracking its progress as it expands through the atmosphere. In addition to disrupting weather patterns, Oprah’s ego is thought to be responsible for a rash of airplane near-misses, as well as a host of end-of-the-world predictions. The Obama administration, which is a subsidiary of Oprah’s Harpo Productions, is said to have dispatched the Navy Seals’ celebrated Team 6 to find and capture Oprah, who, since donating her ego, is nowhere to be found. The hope is that Oprah might be able to persuade her ego to return to her body. Apart from the danger that Oprah’s gigantic ego presents to life on Earth as we know it, its puzzling physical properties have scientists salivating at the prospect of plumbing the secrets of subatomic structure. Psychologists have also evinced a fascination with the progress of Oprah’s ego. The human ego has been long thought to be a metaphorical concept situated somewhere between the cingulated sulchus and the corpus callosum in the posterior lobe of the brain’s Romanoff region. Now, however, the behavior of Oprah’s ego raises the intriguing possibility that the medieval scholasticists were correct in describing the homunculus egoisus as a physical entity usually situated in the Belucci canal between the spleen and the islets of Langerhans. 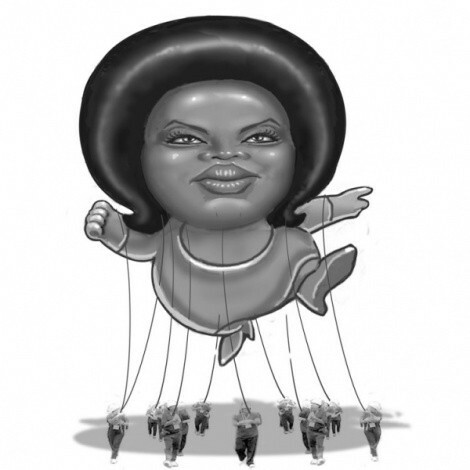 Nevertheless, there is a growing consensus, especially among theologians, that the monstrous ballooning of Oprah’s ego is unique, a once-in-the-history-of-the-world occurrence.